Virginia State Quarters are the tenth variety in a series of fifty design changes over a ten year period from 1999 to 2008. This Quarter was released into circulation on October 16, 2000. The reverse of the Virginia quarter shows three ships sailing from London to the new world. The ships names were Susan Constant, Godspeed, and Discovery. These ships carried 104 brave settlers and finally landed on an island in the James River about 60 miles from the ocean. 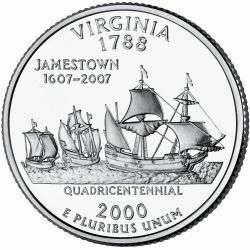 The reverse of the coin bears the inscriptions "VIRGINIA 1788", "JAMESTOWN 1607-2007", "QUADRICENTENNIAL" and "E PLURIBUS UNUM" along with the date of 2000.